Doris Morris is an illustrated children’s book aimed at four to six year olds and tells the story of Doris the cat who lives with the Morris family. In the first of the series, The Invasion of the Neighbours, Doris has to deal with Gangsta and Lizzie, local cats who come in and trash the house – getting Doris into trouble. Thankfully Amy and Ted are to hand to put things right. 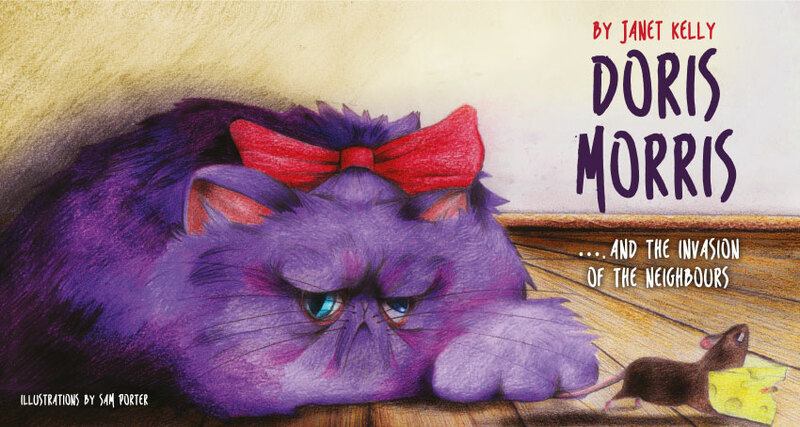 This book is too adorable – it is about a cat named Doris who is fuzzy and dirty and a typical house cat. She can be temperamental but the kids love her and she has it pretty good in the Morris household. When two neighborhood cats start coming in and messing up her house and her happiness the children in the house help her make it all right. The lesson at the end of this rhyming book is a very cute one – family is always there for you and I loved the vibrant illustrations throughout. Doris is a huge purple fluff of a cat in most the images and I loved the color pallet. I think that kids and parents will really enjoy reading this book together.